Phyllis Peabody and Heather Nagel loaded the last stash of gift wrap supplies into the back of an SUV Monday morning. It barely fit. 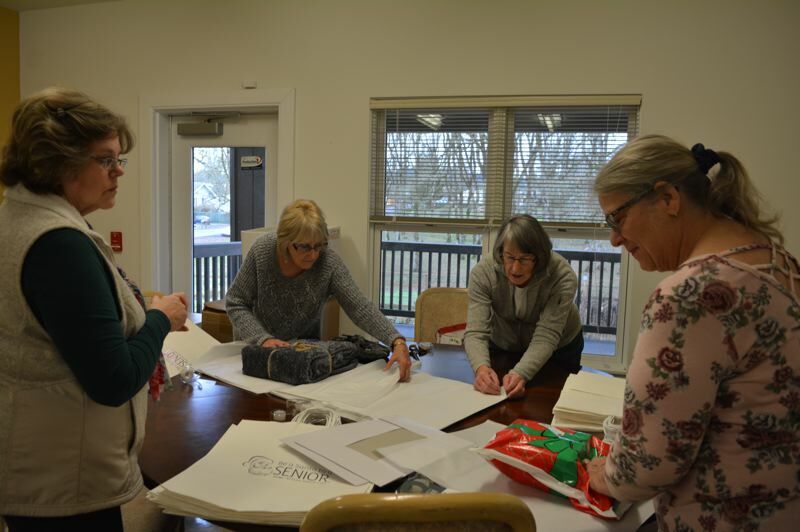 After a push, a holiday print bag rested snugly atop two large boxes and the vehicle pulled away from the Scappoose Senior Center toward St. Helens, where a handful of volunteers packed into a room to wrap more gifts. Before noon, volunteers at both St. Helens and Scappoose senior centers had wrapped close to 100 items. The presents, ranging from household items like bath towels to slippers and sweaters, will be delivered to home-bound seniors before the Christmas holiday. It's all part of the "Be a Santa to a Senior" program carried out each year by Home Instead Senior Care. The elder care franchise partners with community groups and retailers like Bi-Mart in Scappoose and Rite-Aid in St. Helens to give gifts to seniors who qualify for the Meals on Wheels program. 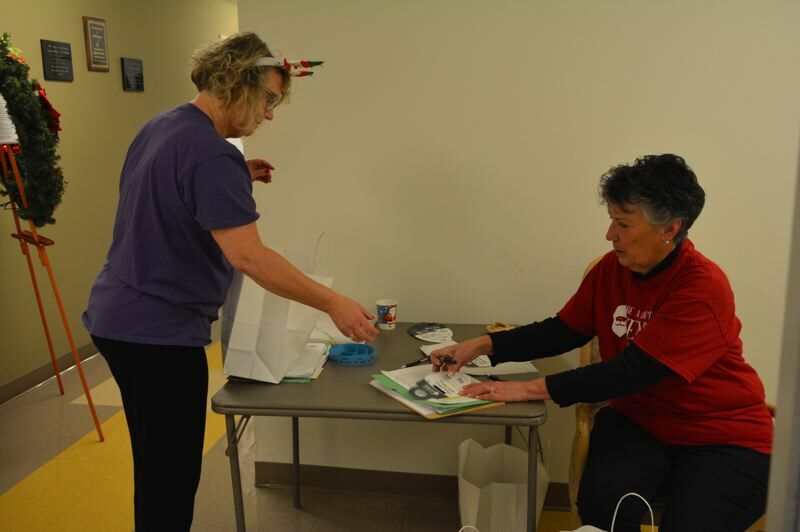 Since its inception 15 years ago, the program has grown to serve more than 700,000 seniors nationwide and, this year, 615 seniors from Columbia, Yamhill and western Washington counties will receive free gifts. Between Scappoose and St. Helens, 90 seniors are set to have presents delivered. Another 50 seniors in Rainier and Clatskanie are on board to receive items, too. Home Instead Senior Care started the program as a means to bring joy and brighten the spirits of seniors who often don't have the means to leave their homes. Each year, a wreath is placed at retailers in participating areas with a paper ornament that lists items requested by a senior who receives meal deliveries. Shoppers can take the ornament, purchase the items, then leave them at the site for pickup by Home Instead workers. Even if some of the bulbs don't turn into benefactions, the senior care company steps in to fill the gaps. "We make sure no senior is forgotten about, and no senior is left behind," Peabody says. As she and her colleagues unload bags of gifts, four women gather around a table to start wrapping. Dianne Juergens checks tags to gifts at a table just outside the room. "When I started doing this, I wrapped 46 gifts," Juergens recalls. "This year, we had 600 ornaments, and each had two gifts. It's been a good program." Peabody says the program aligns with Home Instead's mission and serves a segment of the population that is often forgotten about around the holidays. "There are two demographics of people in our world that need care: babies and infants and elder seniors," Peabody says. "They need help in some way to take care of themselves. A lot of these seniors are maybe the last ones standing in their family, or maybe they have family on the East Coast, or maybe they're on an economic level, where the thought of it is just not going to happen." Two years ago, the American Geriatrics Society released a set of guidelines for providing care to a growing number of "unbefriended" Americans living alone, without designated caretakers or decision-makers. AGS noted the number of aging adults living alone as a "unique and growing" group, suggesting more seniors are disconnected from immediate or extended family, or have not designated anyone to help carry out decisions about care or medical treatment when needed. "Home Instead is about changing the face of aging," Peabody adds. "In our world today, nobody knows how to age well. This is our way of changing that. Everybody deserves to be loved and cared for. We do it year-round with our caregivers. This is the time of year that we can bring in the community."